During our house hunting days, our agent Howard Hanna’s Edie Myher drove us through Larchmere repeatedly as we toured homes throughout Cleveland Heights and Shaker Heights. Larchmere caught my eye because the little neighborhood is colorful and filled with interesting local shops. Larchmere is apparently one of the oldest planned shopping districts in the country, established in 1929. Lucky for us, the neighborhood has kept some of its older buildings that now co-mingle with more modern condos and wide sidewalks for strolling to and from shops and restaurants. Ah, restaurants—the subject of this post! We visited Felice Urban Café earlier this spring, a popular local restaurant in a turn of the century house. Felice has been around since 2008, and descriptions from reviews posted on other websites describe it as serving Spanish/Mediterranean food. 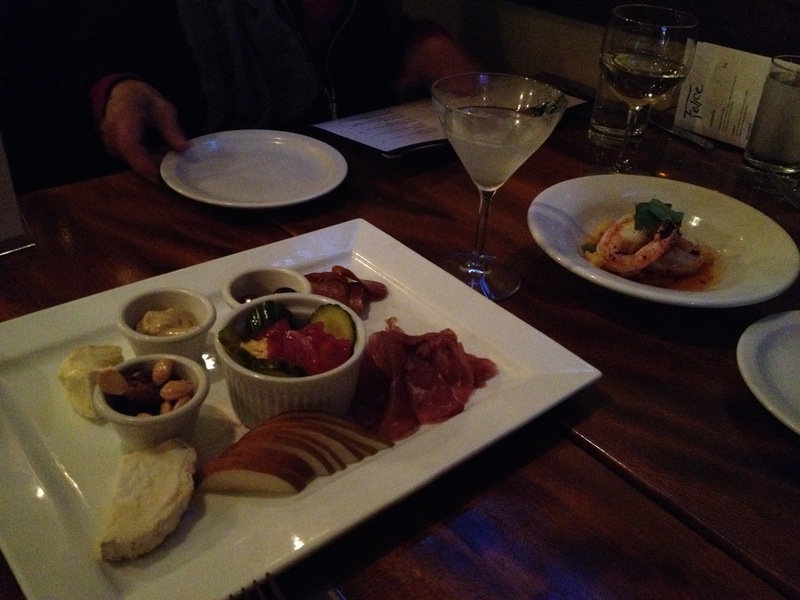 Felice is also known for its happy hours, especially late night and on the porch. When I think Spanish food, I immediately think tapas. I haven’t had good tapas since we visited Spain itself about a year ago. If you aren’t familiar with tapas, think many, many small plates and sharing. 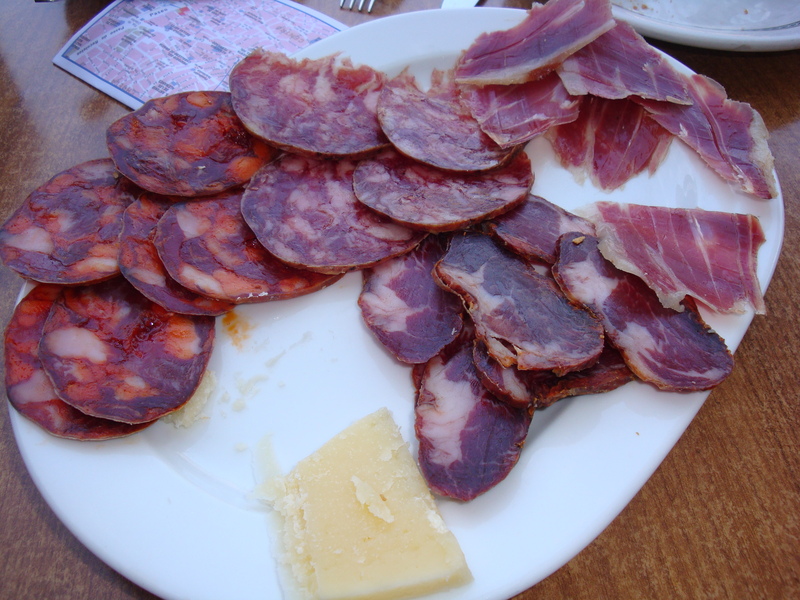 I also think of gambas (camarones) al ajillo, manchego cheese, and jamon iberico (Figure 1). Oh, my mouth waters just thinking of it! Figure 1. A bunch of ham and manchego cheese at Plaza Mayor in Madrid, Spain (2014). Alas, Felice is not a tapas place, nor would I describe it as Spanish as other reviewers have. I mean, they serve tacos which is hardly Spanish. And, these are not Mexican tacos, either. I would describe these tacos as modern California-style but not just limited to fish or modern Tex-Mex like Lopez on Lee Road. On our particular dining night, we had various tacos (Figure 2) including the lentil tacos (Steve flexing his vegetarian muscles again). We also started with garlic shrimp and the big board, a nice mix of meat and cheese (hands off, Mom! ; Figure 3). Figure 2. 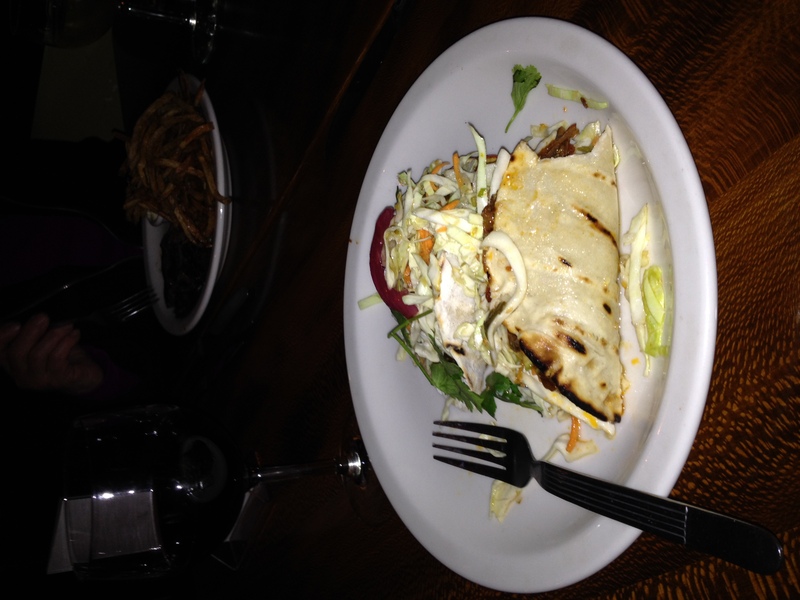 These tasty tacos are neither Spanish nor Mexican. Figure 3. The big board has meat, cheese, and other stuff to make a table happy and satisfied until the entrees arrive. Overall, the food was pretty good once we corrected our mindset. And the people watching was a lot of fun. The biggest disappointment for me was the cocktail execution. The list was nice, but the actual mixes were watered down and tasted cheap. This surprised me very much given this place is known for its happy hour. Maybe it was an off night…who knows. All I know is that this place is only five minutes from our house, so I know we’ll be back ordering those non-Spanish tacos again. Posted in Cleveland Calculus and tagged Cleveland Independents, Larchmere.